Lighted Tri-fold mirror with 8 LED Lamps built-in for your convenience. You can use this handy mirror in dimly lit places, or at nightclub for easier makeup application. Tri-Fold Design: Easy to carry for your daily maintenance – simply open it when you want to use or fold it like a book when not using to protect it from dust or scratches. Can stand on your countertop and it can be 180° freely adjusted so you can adjust as needed (find a perfect and comfortable viewing angle to use it). 1. Beauty enthusiasts, especially those who love to concentrate on their appearance will like this mirror most. 2. 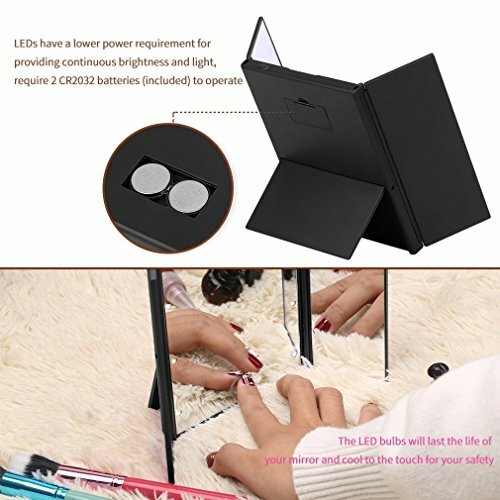 For people who regularly want to Make-up, this light mirror is easy to carry and convenient to use. 3. 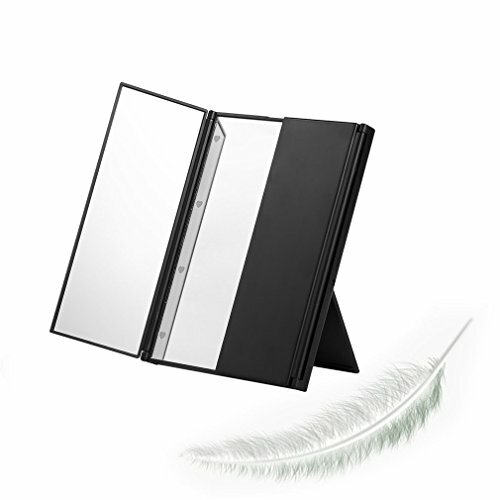 For people who work at night, this mirror can be utilized in dark places when they apply makeup. 1. First open the mirror and open the top right switch. 2. LED lights on so You’ll be able to comfortably use the mirror. 3. Use the switch to turn off and close the mirror. 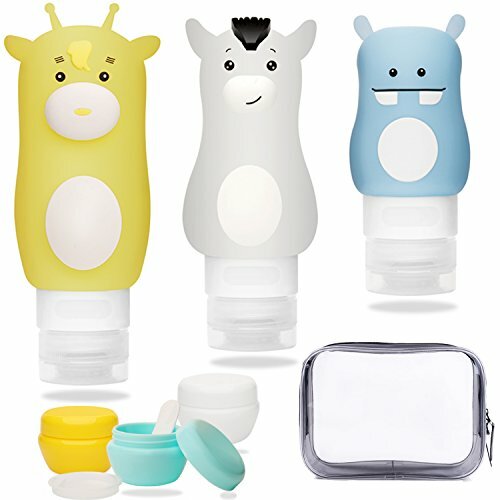 The ON/OFF switch located on the top of the device will activate the power when you wish to have it. 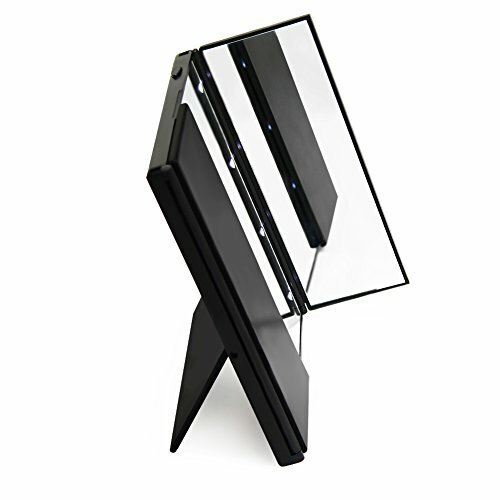 This LED lighted makeup mirror fits easily on the table top and includes an adjustable up and down tilt? Lighted Tri-fold mirror with 8 LED Lamps built-in for your convenience. 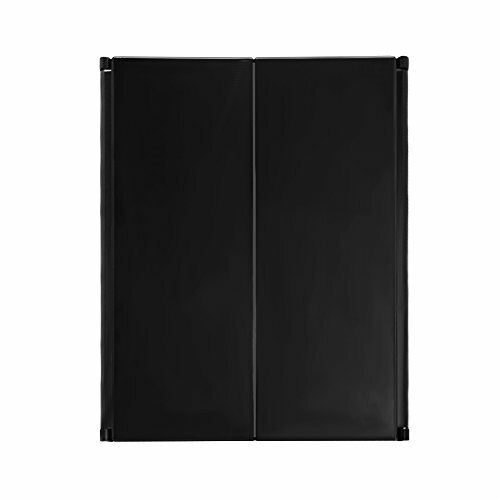 You’ll be able to use this handy mirror in dimly lit places, or at nightclub for easier makeup application. 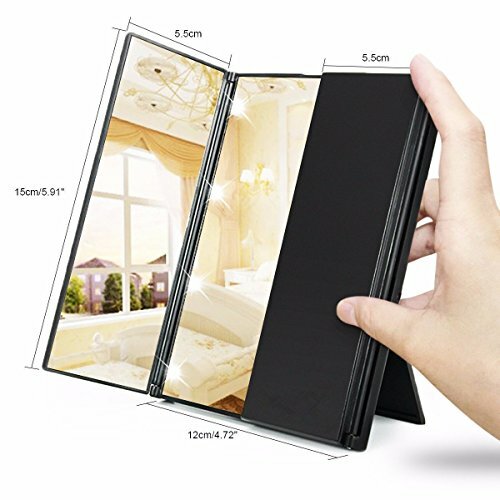 Tri-Fold Design: Easy to carry for your daily maintenance – simply open it when you need to use or fold it like a book when not the use of to give protection to it from dust or scratches. Can stand on your countertop and it may be 180° freely adjusted so You’ll be able to adjust as needed (find a perfect and comfortable viewing angle to use it). Easy to carry. 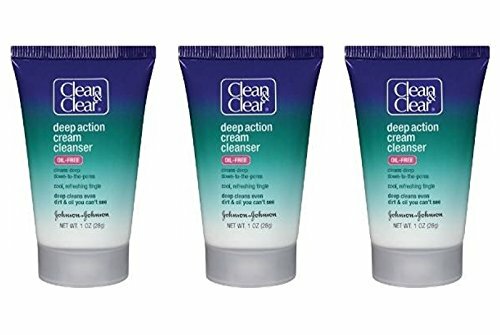 Not large and You’ll be able to put it in your handbag when traveling. Open the battery case,remove the release paper before you click the swith.